The high performance hot water power washer is very compact with a modern and functional design and it offers high performance. 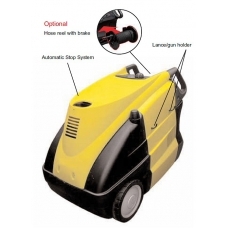 This top of the range professional hot water pressure washer is designed for heavy-duty usage. It is fitted with the latest technology such as a water-cooled jacketed pump for extended pump life and reliability. The control panel has Analogic Dial Controls for simplicity whilst the low 24V voltage switches make for safe operator usage. 4 poles electrical motor and thermal protection. Three ceramic pistons, brass linear pump head with seperated external bypass valve. Suction and delivery stainless steel valves. Vertical burner with high thermal efficiency steel coil. Anti leak diesel burner nozzle. Digital control panel with hours counter, motor lamp monitoring, burner and low fuel cut out; fault indicator; and anti-leakage device. High precision burner temperature digital setting.